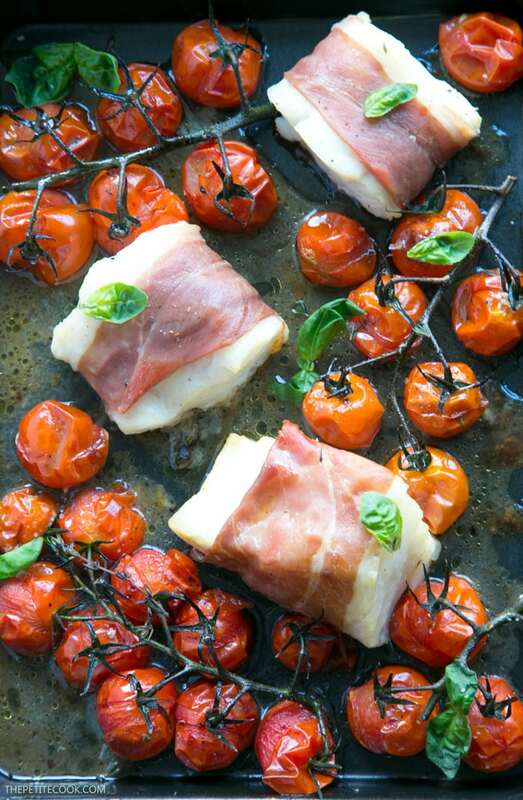 Make dinner easy with this Prosciutto Wrapped Cod with Roasted Tomatoes – A one-tray italian-style meal, gluten-free, dairy-free and ready in just 20 min. There are three main reasons why I love cod: it’s cheap, sustainable and extremely versatile. Not to mention is loaded with nutritional value. OK, it’s four reasons, and I could gather even more, because it’s such a great fish! This recipe is inspired by the place where I grew up, my beloved Sicily. Although this is not a specific traditional sicilian recipe, it definitely showcases some of its staple ingredients: fresh cod, cherry tomatoes (Pachino’s are the best!) and fresh aromatic herbs such as oregano and thyme. 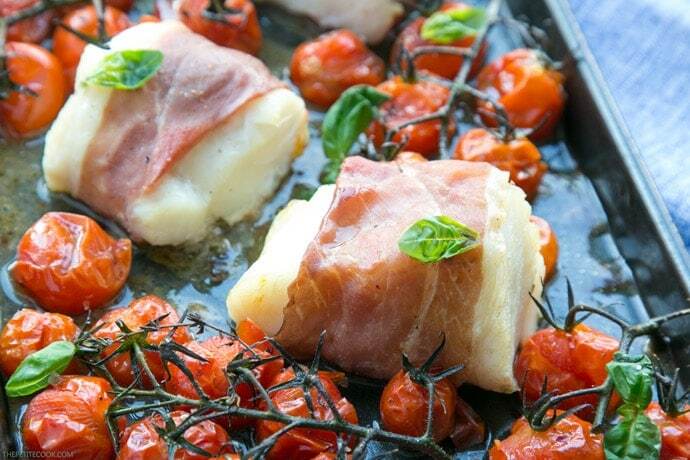 Effortlessly easy to prepare, this Prosciutto Wrapped Cod with Roasted Tomatoes takes less than 30 min to make. All you need it’s just few simple fresh ingredients: cod fillets, prosciutto – Italian salt-cured ham, cherry tomatoes, good balsamic vinegar, garlic and fresh aromatic herbs. I’ve used freshly dried oregano my mum sent me off from Sicily a couple of weeks ago. But fear not. If your mum doesn’t live in Sicily though, I’m sure you’re all gonna be fine with any freshly dried oregano leaves, even better if you make your own. Same goes for the tomatoes, organic vine-ripened cherry tomatoes are particularly sweet and just perfect for this recipe. This recipe calls for super simple ingredients in typical Sicilian fashion, the key is choosing the best ingredients you can source. It’s also naturally gluten-free and dairy-free. 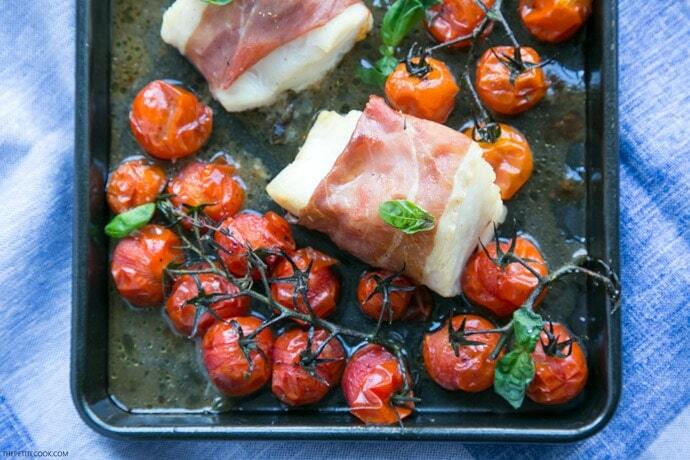 My favorite part of this Prosciutto Wrapped Cod with Roasted Tomatoes is that it can all be made on one tray. No fuss, no multiple pans required, only a bowl to season the tomatoes and a baking tray where you can arrange all ingredients. Simple, easy, quick. 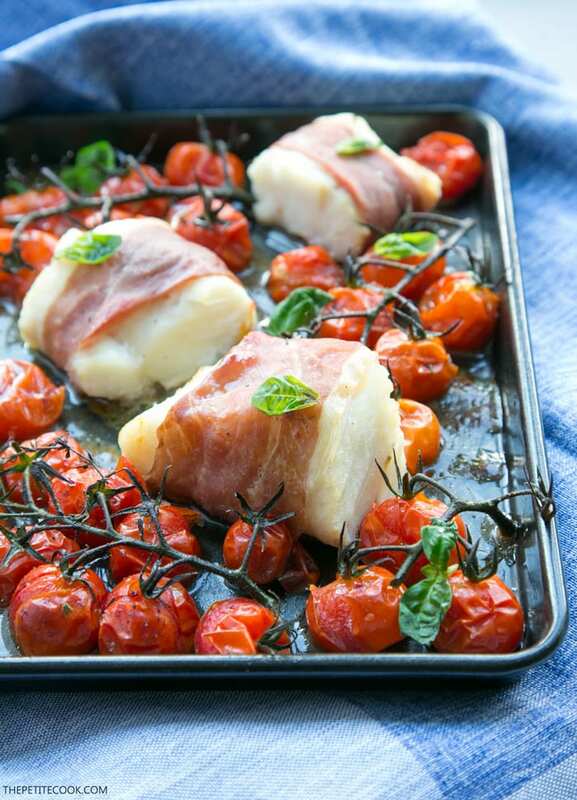 Make dinner time easy with this Prosciutto Wrapped Cod with Roasted Tomatoes - A one-tray easy italian-style meal, gluten-free, dairy-free and ready in just 20 min! Season the fish with salt and pepper, then gently wrap tightly each cod fillet with a slice of prosciutto. Brush each fillet with a little olive oil then place on a baking tray. 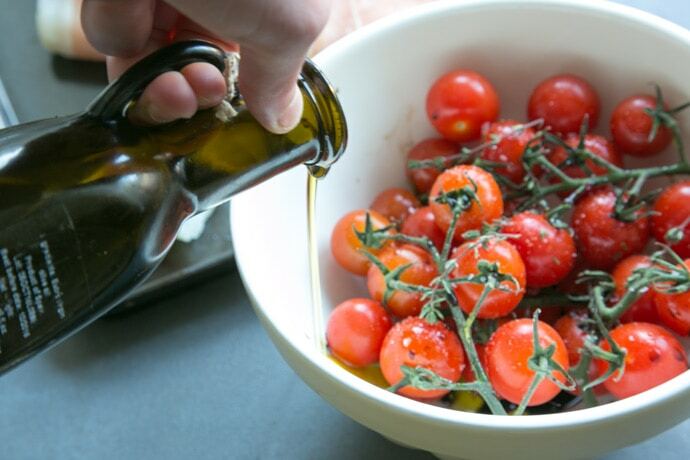 In a bowl, mix together the tomatoes with 1 tbsp of olive oil, balsamic vinegar, garlic, oregano and thyme. Season with salt and pepper and gently mix until tomatoes are well coated. Place the tomatoes on the tray, pouring over them any leftover dressing. Bake in the oven in the middle shelf for 10-15 minutes or until the fish is opaque and cooked through (it should flake easily). Remove the fish from the oven and set aside on a warm plate. Move the tray on the top shelf and continue to cook the tomatoes for a further 4-5 min. Remove from the oven, arrange the fish back in the tray and sprinkle with few basil leaves (optional). Serve to the table family-style directly from the tray.